Rochelle is thrilled to be joining the team at MOVE Wellness Studios. Rochelle discovered Pilates about 10 years ago and was delighted with the dramatic changes she saw in her own body and energy level; she’s been an avid Pilates devotee ever since. 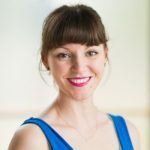 Rochelle will be teaching STOTT Pilates Mat and Reformer classes, TRX, Bootcamp, and Barre classes. She is also available for private instruction. When she’s not teaching, you can find her behind the desk at MOVE Wellness Studios, or onstage with her duo, The Potter’s Field.